Following yesterday’s review of the results from all the openly lgbt athletes at the recent Winter Olympics in PyeongChang we turn to other issues which emerged. After that I finally reveal my new list of over 300 lgbt Olympians. For the second Winter Olympics the issue of lgbt lifestyles became a major talking point. Or rather, it didn’t, if you were US figure skater Adam Rippon and US Vice-President Mike Pence. Not face to face, at least. Mike Pence and President Donald Trump have made no secret of their intention to restrict or even abolish some of the equal rights that were introduced in recent years. Adam Rippon took the brave step of openly criticising the Trump-Pence administration on these issues. A long-running exchange of comments between Adam and Pence lit up the “twitter-sphere” for several weeks. Even with verbal homophobic abuse from Pence supporters Adam managed to be one of the stars of the Olympics and win a bronze medal. As mentioned yesterday Brian Orser was one of 11 openly gay figure skating coaches and choreographers to a large number of the skaters in PyeongChang. Between them they either coached or choreographed 5 gold medallists and 3 bronze medallists. One fact that interested me was that all of the South Korea’s home nation figure skaters in the team event were coached or choreographed by 3 openly gay Americans. It may be a surprise to learn that there have not been any known openly lgbt figure skating judges as the Olympics. Until now. Jeff Lukasik made his Olympic judging debut. Among others he was one of the judges of the pairs figure skating in the team event, helping to judge Eric Radford and his fellow Canadians to a gold medal. The Canadians built upon their pioneering Pride House at the Vancouver 2101 Winter Olympics by hosting the official Pride House of PyeongChang in the Canadian base in the Olympic village. The Pride House is a place of lgbt athletes and friends to meet and socialise. From Vancouver 2010 the Pride House movement has spread beyond the Olympics. Several are planned for other international events this year, including the Commonwealth Games. The Korean Sexual Minority Culture and Rights Centre were the organisers of the PyeongChang Pride House in the Canadian Olympic Committee’s base. The American media made a big fuss over one incident. Before Gus Kenworthy went to compete in his slopestyle event he kissed his boyfriend in front of an American camera crew. The Americans made more of this kiss than any other nation. However, they are not the first male couple to kiss at the Olympics. Edward Gal and his husband Hans Peter Minderhoud kissed in front of a camera crew live on the BBC during the 2012 London Olympics. There were several times when the Rainbow Pride flag or one of its variants appeared on screen. This is in stark contrast to the pre-London 2012 Olympics where the IOC banned all non-national flags from its venues. During the competitions in which Adam Rippon and Gus Kenworthy appeared the rainbow flag was seen several times, as was the American variant where the Stars and Stripes become the Stars and Rainbow stripes. 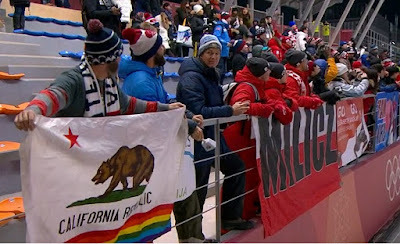 At the 2-man bobsleigh event on 18th February the Californian Rainbow flag was displayed prominently at the finish line (picture above). One of the recent innovations introduced by the International Olympic Committee recently is the right for all Olympians to have post-nominal letters indicating their Olympic status. Just like a PhD or OBE Olympians can now place the letters OLY after their name. It’s not an automatic entitlement. Olympians have to apply to be registered for the honour. I think it should be automatic and be applied posthumously. Finally we have the medal table. How well did Team LGBT do? With 2 gold medals, 2 silvers and 3 bronzes we finished in equal 14th place with the Czech Republic. As for the individual results, who moved up the all-time medal table and who moved down? Below is the table of the lgbt PyeongChang Olympians giving their former and current positions, including the 4th to 8th places where diplomas were awarded. Ireen Wüst went straight to the top, lead-frogging over swimmer Ian Thorpe. Of the Olympians making their debut Adam Rippon was the most successful, going straight into 139th place with his bronze medal. This, and Brittany Bowe’s bronze medal, means everyone below 139th place moved down 2 places. Eric Radford made the biggest leap up the chart. By winning a gold medal he jumped 66 places up to 31st position. So, here is the final lgbt Olympian list.